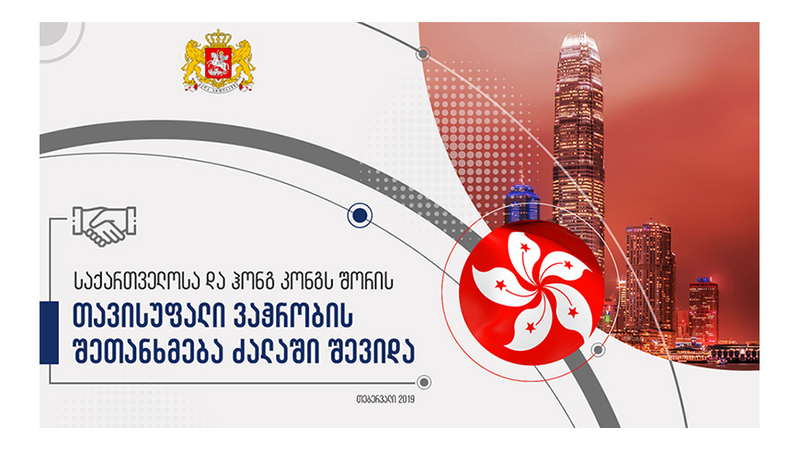 Free Trade Agreement between Georgia and Hong Kong became effective from February 13 this year. Georgia-Hong Kong Free Trade Agreement was signed on June 28, 2018, in Hong Kong within the framework of the One Belt- One Road summit. The purpose of the agreement is to determine the terms of the free movement of the goods between Georgia and Hong Kong – the Special Administrative Region of the People’s Republic of China as well as to promote trade of services. The new generation agreement between the parties also covers such topics as promotion of customs and trade, intellectual property rights, technical barriers to trade, sanitary and phytosanitary measures, etc. Georgia is the first country in the region with whom Hong Kong has signed a free trade agreement. The agreement will increase awareness of Georgia, its business climate and promote trade and investment flows between Hong Kong and Georgia. Hong Kong conducts open economic policy and represents one of the largest key transnational financial centers of the world. Enactment of the Agreement will facilitate the growth of the trade turnover between the parties and give Georgian entrepreneurs chances to introduce their products and services without additional bureaucratic barriers to a 7-million consumer market.